Knee pain is the second largest cause of chronic pain in the United States, and millions of people are suffering from hip and foot pain on a daily basis. The hips and knees are the largest joints in the body responsible for the way we walk and stand, and pain in these areas, as well as in the lower back, neck, and shoulders, might stem from the feet. All you have to do is to stand on the toes and start walking at an accelerated pace for 5-15 minutes. 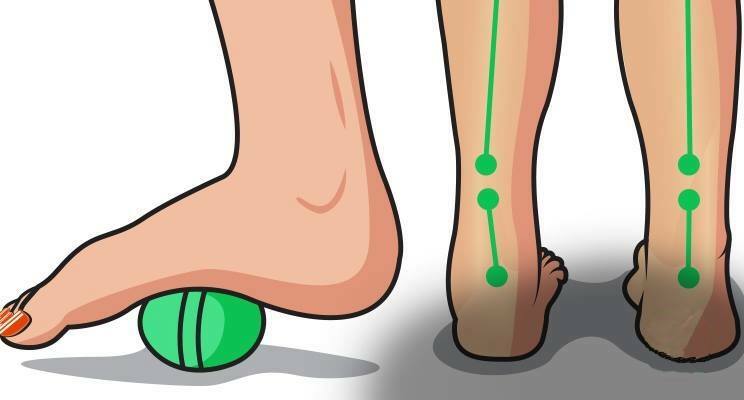 While sitting on a chair, roll the foot over a tennis ball on the floor, and thus massage from the toes to the heels. While sitting or standing, raise one leg and start rotating the foot slowly in a circular motion, 10 times clockwise, 10 more counterclockwise, and then repeat with the other leg. Wrap the band around a chair or a bed, sit on the ground, and place one leg under the other. Bend the knees a bit, and try to grab the band with the foot of the upper leg. Bend the foot back towards the head, while stretching the band, and loosen. Make 10 repetitions with both legs. Hold the back of a chair and stand behind it. Use it to maintain your balance while raising one leg behind you at the knee. Then, raise the heel of the other leg slowly, so that you are standing on your toes, hold, and lower the body in the heels again. Make 10 repetitions with both legs. Curl the toes and try to pick up a towel from the floor with them. Repeat 10 times with both feet. “ Never wear heels over two inches high. Heels increase the risk of knee joint degeneration. However, not all flat shoes are good for your feet. Flats that do not provide any arch support can lead to knee, hip, and back pain. Get the right fit. Tight shoes can cause limping from foot pain. Oversized shoes can also impair your gait. Either way, you’ll be putting unnecessary stress on your knees and hips. Stability sneakers provide cushioning and help control overpronation. They also relieve the ball of the foot, which helps arthritic pain in the hip, knee, foot or ankle. Replace your shoes as needed. When the supporting cushioning becomes worn, it is no longer helpful.